Today’s Google Doodle features Marshall McLuhan, one of the world’s most well-known media studies scholars. Although McLuhan never saw the rise of the Internet (he died in 1980), his ideas on technology and education were both revolutionary and visionary. Indeed, when WIRED Magazine launched in 1993, the editors declared McLuhan to be the magazine’s “patron saint.” What WIRED‘s editors recognized then and even more people recognize now is that McLuhan’s insights anticipated the digital world in which we now live. McLuhan’s ideas on education and specifically, how technology could make education more engaging, relevant and innovative were also revolutionary and visionary. Indeed, in many respects McLuhan foresaw the rise of what we now describe as eLearning. However, McLuhan wasn’t necessarily pessimistic about education’s future. Indeed, unlike many of his contemporaries, he believed that new technologies, including television, could be used to fix what he saw as the education systems’ most entrenched problems. But he emphasized, “Before we can start doing things the right way, we’ve got to recognize that we’ve been doing them the wrong way.” The “wrong way,” according to McLuhan was rote learning. The right was was a self-driven, interactive, and technologically enhanced approach to education that would engage all a learners’ senses. McLuhan teaching at the University of Toronto. While the idea of eLearning was still in its infancy in the 1960s (this was the decade when PLATO, arguably the world’s first eLearning experiment, was developed and first launched), McLuhan had a clear vision for education’s future. He believed that to fix education, we needed fewer teachers, more technology, and most importantly, a more positive outlook on technology. A historian by training, McLuhan appreciated that in many respects, education hadn’t changed much since the invention of the Gutenberg printing press in the late 15th century. To reach today’s students, we needed to stop relying on primarily visual modes of delivery and create multi-sensory, interactive student-driven learning environments. Without using the term eLearning, he even appeared to predict how this education might begin to take shape. We have to ask what TV can do, in the instruction of English or physics or any other subject, that the classroom cannot do as presently constituted. The answer is that TV can deeply involve youth in the process of learning, illustrating graphically the complex interplay of people and events, the development of forms, the multileveled interrelationships between and among such arbitrarily segregated subjects as biology, geography, mathematics, anthropology, history, literature and languages. Here, it is important to remember that for McLuhan, television was not a passive medium but rather an active one and one that even brought people across great distances together. In many ways, it is in his optimism about television that one encounters his most fascinating and accurate predictions about the electronic age and future of education. 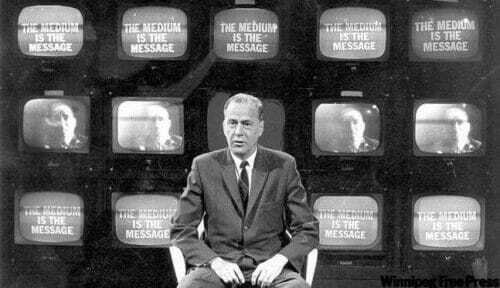 There is no question that had McLuhan lived to be 106, he likely would have been an early adopter of MOOCs. First, McLuhan loved an audience and the larger the better. In the 1960s and 1970s, he appeared on dozens of talk shows and news programs and even once appeared as himself in the famous Woody Allen film Annie Hall. Second, McLuhan would have loved the fact that with MOOCs, learners can work at their own pace and using a variety of mediums that engage different types of senses. Finally, and most notably, McLuhan, who coined the term “Global Village,” would have supported MOOCs as a way to bring together learners from around the globe. He may have even considered MOOCs part of what he envisioned as a necessary “retribalization” process in education and society. While McLuhan remains a controversial figure in media studies and education, it is difficult to deny his ongoing influence. As he once explained, “If we don’t adapt our educational system to [today’s youths’] needs and values, we will see only more dropouts and more chaos.” This was clearly something he got right and on this basis, it also seems likely that had McLuhan reached the ripe old age of 106, eLearning and perhaps, especially eLearning on a massive scale (as seen in MOOCs) would have been one current trend in education to which he lent his full support. With GeoGebra, we were able to bring high-quality interactive elements to a free, open source curriculum. It’s an honor to work with this great team.